Ukrainian-born Ilya Repin’s life spanned the turn of the 20th century, a particularly turbulent period in Russian history. A member of the Itinerants, he is one of the most celebrated social realist painters of all time, painting the lives of poor peasants and revolutionaries in exquisite detail, eschewing the burgeoning contemporary European impressionist movement. His paintings are a satirical commentary on the contemporary society of the Russian Empire, depicting scenes of peasantry (‘Barge Haulers on the Volga’), political and military scenes (‘Demonstration 17 October 1905’) and Cossack life (‘The Reply of the Zaporozhian Cossacks to Sultan Mahmoud IV’). Soon after his death in 1930, Repin had developed into a cult figure. Revered by Stalin (supposedly his “favourite artist”*), his realistic portrayals of daily life inspired the ‘Socialist Realism’ of the new, centralised USSR. This genre depicted the suffering working classes as heroic in their struggles, which became heightened as the “elite” of the Stalinist regime were hypocritically bathing in the excesses that the position afforded them. Stalin and Repin had similar beginnings, in that they were born into poorer families, in non-Russian soviet republics; the former being a Bolshevik revolutionary, whilst the latter was undoubtedly a sympathiser in the fight for social justice. However, somewhere along the way Stalin’s desire to escape the misery of his childhood lead to an abandonment of his roots, a skewing of his principles and a misappropriation of Repin’s work to champion his newly-held ideals. 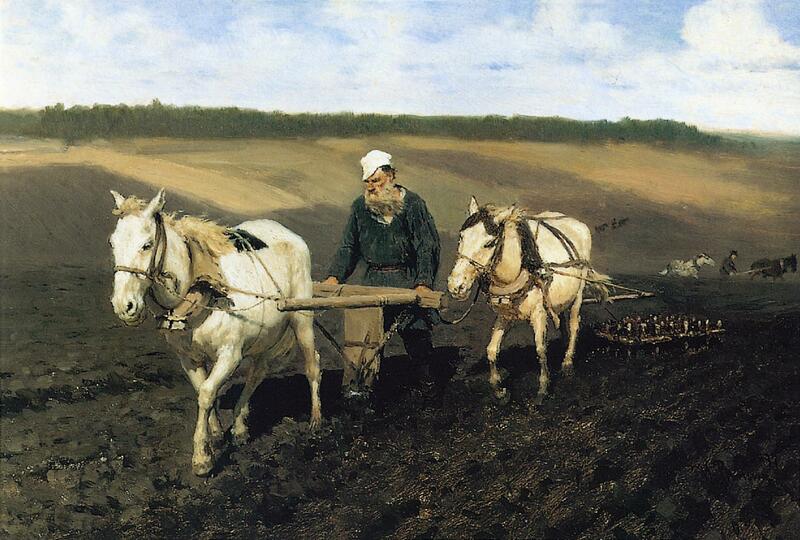 Ilya Repin, Leo Tolstoy as a Ploughman on a Field, 1887. Oil on cardboard, 27.8 x 40.3 cm. Why is it that there is so often a discrepancy between the austere measures a regime advocates for its citizens and the lavish lifestyle the officials themselves lead? From examples as tame as the privately educated millionaires that make up the current British government, and the ostentation of the Pope, to the more extreme cases of autocrats living the high-life whilst their citizens starve, this is evident the world over and repeated cyclically. As power turns heads, it also turns minds. A love of art may become more sterile, as only ‘state-approved’ art get the seal of approval. Hitler approved of the Great Masters, where the spiritual morality and family values depicted could be manipulated to suit his own manifesto, as well as having art made to order by his favourite, compliant artists. Under most dictatorships, artistic intelligentsia are driven underground for fear of being purged, either for vocally dissenting from the regime, or due to the expectation that they would do so. 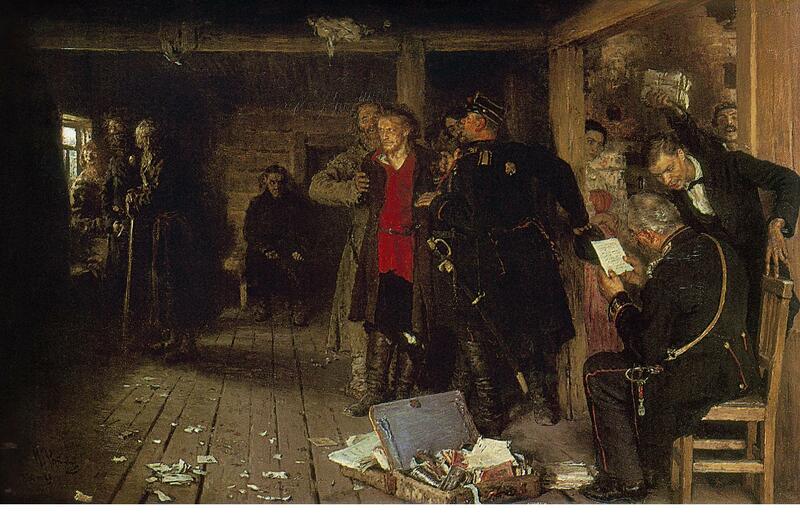 Ilya Repin, Putting a Propagandist Under Arrest, 1880-1889. Oil on canvas, 34.8 x 54.6 cm. The State Tretyakov Gallery, Moscow. Ironically, if Repin had been alive during Stalin’s reign of terror, it is reasonable to believe that he would have been painting scenes to satirise this monstrous hypocrite and his actions that, amongst other things, lead to around 7 million of Repin’s compatriots starving to death during the Ukrainian Famine of 1933. And had he lived on to lampoon, he would almost certainly no longer have been Stalin’s golden boy. If you happen to be in Tokyo, check out the Bunkamura Museum where they are holding an exhibition (‘ILYA REPIN: Master Works from the State Tretyakov Gallery’, until Monday 8 October) featuring 80 Repin works on loan from the State Tretyakov Gallery. If Japan seems like a long way to go to see Repin’s works, why not try this Ilya Repin ebook instead, featuring many more masterpieces by this excellent realist painter. * Rappeport, H. (1999). Art and Architecture. In: Joseph Stalin: A Biographical Companion. (p. 7). California: ABC-CLIO, Inc.